At-A-Glance Floral Wall Calendar offers planning pages for 12 months ranging from Jan - Dec. Calendar measuring 15-1/2 in x 22-3/4 in features white wirebound at top with hanging loop and full chipboard back. Calendar including Julian dates is provided with full-year calendar reference on each page. Calendar is featured with plenty of writing space for notes and appointments. 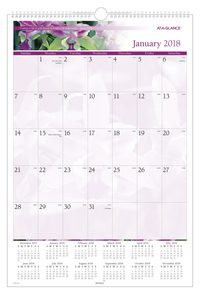 This wall calendar is rendered with a different full-color floral image and quote each month.